American manned Mars expedition. Study 1986. In 1984 a National Commission on Space was formed, with ex-NASA Administrator Thomas Paine at its head. Its report, Pioneering the Space Frontier, was therefore similar to the ambitious plans Paine had proposed in 1969. The cost of just establishing the infrastructure in the 1995-2020 period leading to a Mars expedition in 2026 was estimated at $700 billion. As with Paine's 1969 effort, all of this was much too ambitious, and the plan was never remotely considered by anyone in the legislative or executive branches of government. On 28 June 1986 the shuttle Challenger exploded on its way to orbit, just a month before the final report's publication. Unfortunately this accident ended once and for all the assumption of shuttle-based cheap, safe, and reliable access to space that was the cornerstone of the plan. For the Mars mission, the commission proposed development of new spacecraft based on those previously designed by SAIC and Eagle Engineering. The plan foresaw development of new shuttle and cargo booster vehicles by 2000, a space station by 1992, an Orbital Transfer Vehicle by 1998, and an orbital Spaceport for assembly of Mars and lunar spacecraft by 1998. This infrastructure would be used to establish a permanent base on Mars by 2026. Following unpiloted precursor missions, and drawing strongly on the experience gained in establishing one or more permanent bases on and in orbit over the Moon, people would visit Mars, first to establish Mars outposts, and later to develop Mars bases. A likely plan was that the first humans to visit Mars would do so on the first trip of a cycling spaceship. They would visit the Martian moons, or descend directly to the surface of Mars, using a transfer vehicle with aerobraking. If it were established that Phobos was rich in volatile elements, the first crew to visit Phobos would emplace a plant on Phobos to produce hydrogen, oxygen, and water. The propellants obtained from this plant would support future Mars operations, and greatly reduce the necessary cargoes transported over the long supply line from Earth. On Mars, as earlier on the Moon, habitats and laboratories would be built out of standard spaceport modules. 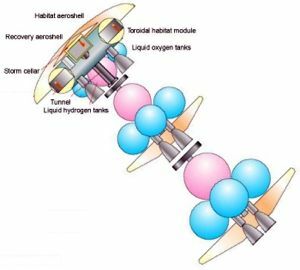 Again, both on the Moon and on, Mars pressurized spaces would be shielded or constructed underground for protection from radiation. There was seen to be a logical sequence of experience for the design of land-roving vehicles both for the Moon and for Mars, and that sequence had already begun with the exploration and permanent occupation of portions of Antarctica. 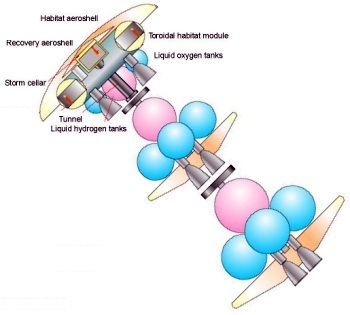 For long-distance traverses of the surface, there would be enclosed vehicles, equipped with full life support systems, in which people could live and work in shirt-sleeve environments for many days. For short trips in the vicinity of outposts and bases, vehicles roughly similar to the lunar rover of the Apollo era would be used. To ride those vehicles, crew members would wear space suits with their own short-period life support systems. For observation, surveys, and checkout of changing conditions, remotely piloted Mars airplanes were likely to be useful. Those relatively small craft would draw on the design experience of low-speed aircraft operating in Earth's atmosphere, and on the extensive experience of remotely piloted military observation craft. The great distance of Mars would dictate not only the development of complete and fully redundant biospheres for operation there, but also the establishment of two or more bases, for example, both on the planetary surface and in orbit, so that a serious problem occurring in one of the bases could be overcome by quickly transferring personnel from the affected base to another. Energy costs would determine what products could be derived economically from the Martian atmosphere. In principle, oxygen, hydrogen, water, nitrogen, fertilizer, and methane, as well as other compounds, could all be extracted from the atmosphere of Mars. As in the case of the Moon, the energy source to support a Mars Base could be solar or nuclear. Solar energy might be more usable on Mars than on the Moon, in spite of Mars' greater distance from the Sun, because the rotation rate of the red planet makes the intervals of darkness only about a thirtieth as long as on the lunar equator. A nuclear generator that powers life support systems would have to include redundant pairs or triplets of generators. The study projected the growth of an initial Mars outpost to a Mars Base in about the third decade of the 21st century. The Mars Base was not seen as an end in itself, but as a logical step in the development of the inner Solar System. The expansion of operations envisioned would require frequent communications contact with the orbital facilities and transfer vehicles throughout the inner Solar System. A number of tracking, navigations, and data relay satellites would be needed. These would be located in geostationary Earth orbit, in orbit around Mars, and in libration points near the Moon. With fully reusable rocket powered vehicles operating between Earth and the Moon, with a network of spaceports stationed near Earth, the Moon, and Mars, with high efficiency transport of raw materials into space for processing, and with cycling spaceships making the long voyage to Mars on a regular basis, the transportation network for the inner Solar System would be fully in place. That network would open the inner Solar System for continued research, productive enterprise, and human settlement. Family: Mars Expeditions. Country: USA. Agency: NASA. Bibliography: 1989, 591.